Listen to "Peppa Pig: Bedtime Stories" on your iOS and Android device. 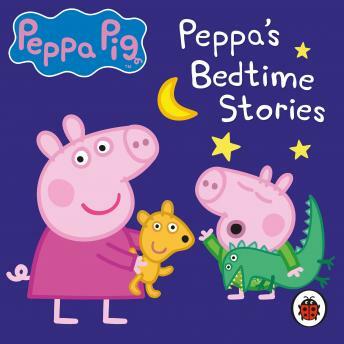 Penguin presents the unabridged, downloadable audiobook edition of Peppa Pig: Bedtime Stories by Ladybird, read by John Sparkes. Includes dialogue, songs and sound effects from the show! Stories include: Bedtime Story, Night Animals, The Wishing Well, Teddy's Playgroup, Pet Competition, Mrs Rabbit's Bump, Naughty Tortoise, The Rainy Day Game, Madam Gazelle's Leaving Party, and Freddy Fox.